Our cybersecurity testing uses the same ranking of vulnerabilities required by the Payment Card Industry, including MasterCard and Visa, required banks, merchants and Member Service Providers (MSPs) to protect cardholder information by adhering to a set of security standards. The Payment Card Industry security standard (PCI) includes MasterCard's Site Data Protection (SDP) program and Visa's Cardholder Information Security Program (CISP). FYI - The FDIC, NCUA, and the OCC do not have a requirement that financial institutions change penetration testing firms on a periodic basis. Any such decision would be up to bank management. 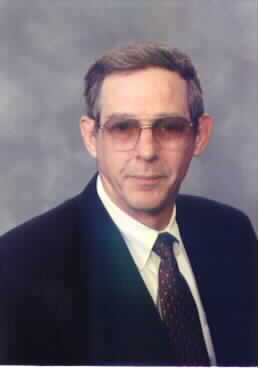 Refer to http://www.yennik.com/occ_10-12-16_rotation_letter.pdf, http://www.yennik.com/ncua_12-21-16_rotation_letter.pdf, and at http://www.yennik.com/fdic_10-18-16_rotation_letter.pdf. These web pages are SSL secured by GeoTrust. Review certificate at https://sealsplash.geotrust.com/splash?&dn=www.internetbankingaudits.com. We have unmatched experience: We differ from other companies offering testing services - we work only for federally-insured deposit institutions. That means we understand the special needs of your financial institution. Our affordable testing is performed by an IT auditor with over 45 years experience (21 years as an examiner) auditing IT departments for financial institutions. In addition, our President, R. Kinney Williams, personally reviews your test results and issues the audit letter to your Board certifying the cybersecurity testing procedures. If you are not satisfied for any reason with our VISTA services, you will owe us nothing. R. Kinney Williams is accredited by the Information Systems Audit and Control Association (ISACA) as a "Certified Information Security Manager" (CISM) as well as a "Certified Financial Examiner" (CFE) by the Society of Financial Examiners (SOFE). VISTA is an acronym for Vulnerability Internet Security Testing Audit. 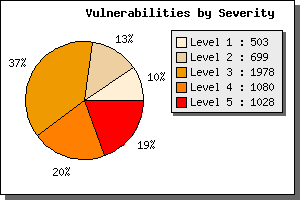 There are over 5,000 known vulnerabilities. 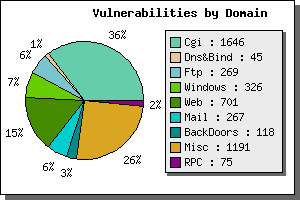 Number of known vulnerabilities by domain. * According to the Computer Emergency Response Team (CERT), 99% of network intrusions occurred based on known vulnerabilities that could have been prevented with proactive vulnerability management. Unlike most penetration testing companies, Yennik, Inc. does NOT sell hardware or software nor do we partner with any entity. We are professional IT auditors and not in competition with your contracted IT professionals. Many IT professionals across the nation refer our auditing services to their clients because they understand that Yennik, Inc. is an independent IT auditing company that provides the regulatory required independence necessary for your penetration-vulnerability testing. For information about affordable VISTA security testing, please select the request form below that meets your security needs or call R. Kinney Williams at Office 806-798-7119 or send an email to examiner@yennik.com. All communication is kept strictly confidential. Why should you use the VISTA security testing services instead of another company? Information Systems Audit and Control Association (ISACA). Our site was updated on 04/11/2019 to ensure current information. ranging in size from $15 million to more than $13 billion in assets and located in 43 states. We are associate members of the following organization, which do not endorse associate members. If you have any problems viewing or using our web site, please call us at 806-798-7119.